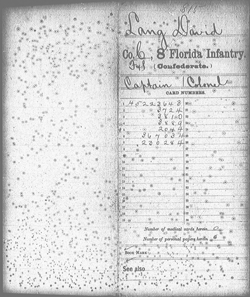 All Civil War Microfilm products are accessed via our Reel Viewer, which closely emulates the look and feel of a "traditional" microfilm reader while allowing for advanced features such as Soldier Search and image tagging. Additionally, our Image Viewer allows image enhancement, zooming, rotation, and many other types of image manipulation -- right from your web browser! Subscribers may also export any image to Adobe PDF format for easy saving or printing. All subscriptions are processed and managed by PayPal, so you're always assured of a secure transaction. That’s 113 reels of microfilm — over 311,000 unique documents! The CSRs are arguably the single most important primary source available for anyone doing research on Florida’s Confederate soldiers. They are transcriptions of the original muster rolls and returns created during the Civil War, and contain some of the most detailed information available about individual Civil War soldiers. They may show enlistment dates and ranks, woundings, captures, imprisonments, hospitalizations, and more. 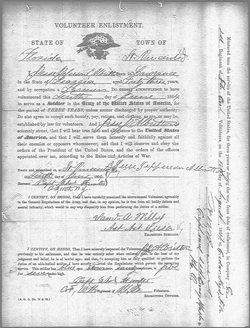 Often, the CSR for an individual soldier also includes original Civil War documents such as pay vouchers, requisitions, discharge certificates, and paroles. All pricing shown on this website is for individual, private use only. If you're a member of a university, library, archive, historical society or other organization, please contact us for pricing. M861 (partial) Compiled Records Showing Service of Military Units in Confederate Organizations. Reel 11: Fifth through Eleventh Infantry Conscripts Campbellton Boys Capt. Harrison's Co. Capt. Parson's Co. In all, this Bundle contains 128 reels of microfilm and encompasses almost all of the Florida-related Civil War information that the National Archives’ microfilm publications have to offer.